Finally, you will be entering a whole new world of search moving closer to the star trek era where a personal assistant understands your voice commands and provides answers to your queries. 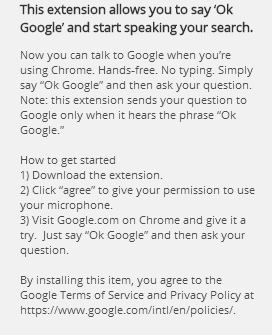 Google has gone ahead and launched the much awaited Hotword Extension for Chrome which allows hands free Google search on your laptop. OK Google how many ounces are in a cup? OK Google what is the temperature today? Ok Google how many calories are there in Oranges? etc. So, what are you waiting for? Just download the extension and enjoy the star trek experience.